Moving Towards an Indigenous Research Process: A Reflexive Approach to Empirical Work With First Nations Communities in Canada expression to the very best research, which can then be used as an evidence base to guide policy making. We are also concerned that research and policy be developed in an ethical manner by taking into direct consideration needs and concerns of the peoples themselves. Being “on Point”: Exploring the Stress-related Experiences of Incarceration apply sociological concepts and methods to the understanding of the social origins of mental health and illness, the social consequences for persons with mental illness, and the organization and financing of mental health services and care. Everyday Life and Mobile Technologies Sociology at Western University. The Sociological Imagination journal publishes the original work of undergraduate students in the field of sociology and related sub-disciplines. The Contentious Field of Whiteness Studies focuses on publishing the theoretical and empirical contributions of graduate students, post-docs, academic professionals, and independent scholars in an open access platform. Each issue of the JST focuses on either a general theme or different specialized topics related to today’s relevant sociological questions, which fall underneath the general umbrella of social thought. Michael Gardiner, "Critique of Accelerationism" Theory, Culture & Society 34(1):29-52. Sage just released Luke Sloan and Anabel Quan-Haase's The SAGE Handbook of Social Media Research Methods , a comprehensive resource for any scholar or graduate student researching social media. Michael E. Gardiner and Julian Jason Haladyn edited a new anthology of essays on the experience of boredom as a vital area of contemporary research: Boredom Studies Reader: Frameworks and Perspectives , Routledge. 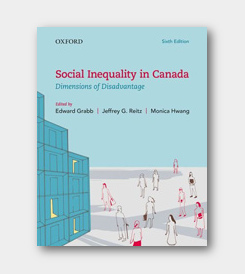 Social Inequality in Canada: Dimensions of Disadvantage, from Oxford University Press, is loaded with contributions by Western Sociology folks, starting with the Co-Editor Ed Grabb. Chapter contributions come from Tracey Adams, Robert Andersen, Ed Grabb, Wolfgang Lehmann, Rod Beaujot, Zenaida Ravanera, Kim Shuey, Andrea Willson, and PhD student Michael Rooyakkers.